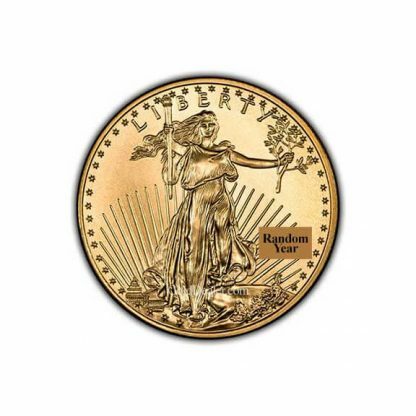 The American Gold Eagle 1/4 oz is a popular gold bullion choice worldwide. In 1986, the United States Mint introduced the American Gold Eagle series in four sizes (1 oz, ½ oz, ¼ oz and 1/10 oz). From 1986 through 1991 the US Mint used Roman Numerals. In 1992 they began using traditional Arabic Numerals. The back features a family of eagles and includes United States of America, E Pluribus Unum, In God We Trust, weight (1/4 oz fine gold) and its symbolic legal tender value ($10). 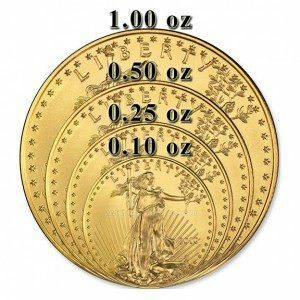 Because of its popularity the US Mint produces quantities of the American Gold Eagle 1/4 oz each year – all of which closely follow the price of gold. Other reasons for its popularity are: (1) The American Gold Eagle 1/4 oz appeals to a worldwide audience because of its low premium. And it is a popular choice for Individual Retirement Accounts. (2) The American Gold Eagle 1/4 oz is easy to buy and sell because dealers worldwide post daily buy and sell prices. (3) The American Gold Eagle 1/4 oz contains one quarter ounce of the gold so valuation is simple. (4) The US Mint places 40 of these gold coins in a plastic tube which allows for easy storage. (5) This coin also has a following in the “survival” community. Those who want a real US gold legal tender coin of smaller denomination for daily needs in case of emergency. 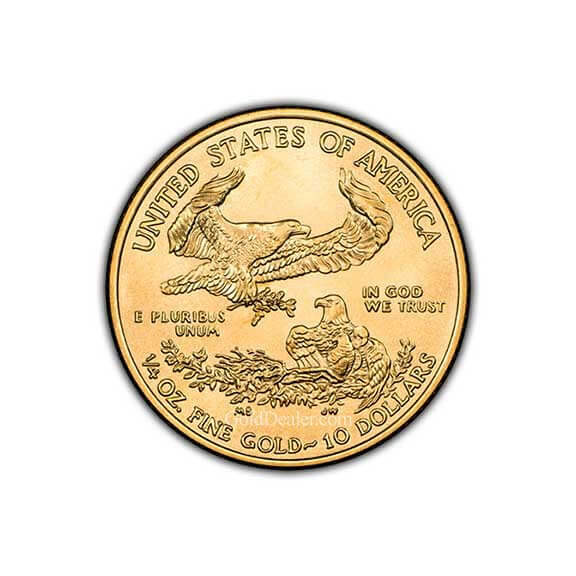 The US Gold Eagle 1/4 oz has no dealer reporting requirement (Federal Form 1099B) when you buy or sell. One of my favorite weights of the American Eagle series, and I seriously like to keep one in the billfold as a good luck charm of sorts too. A bit more of an item of interest in an office than the endless babble about futures, bonds, money markets, etc; and good luck on bringing the new boat upstairs to show off. But oh geez; pass a small American Eagle around a bit; now that kinda makes for the special day of sorts. More realistically; I am grateful to be balancing my future with bullion. Whether it goes up, goes down, or stays the same, the American Eagle will never fail to retain a level of consistent value. They’ll always look neat, have a classic tactile feel; and are literally representations of the United States themselves. Having a proper percentage of my investments in gold Eagles is a big step towards less worry about the conventional stock market going up and down; or in the case of individual stocks; having any investment completely fail in value. That alone is a priceless aspect that the gold Eagles bring to my planning for the future. I did my research before calling on Golddealer.com. First order I talked to Ken; this time I got to speak with Sal. Service was excellent each time; friendly; yet professional. Signature required shipping, no extra charges, best prices on the internet; and the quality of the product easily speaks for itself. I’m looking forward to making a third order; and as before, more diversification of my portfolio.